Action/Drama/Horror/Sci-Fi/Thriller, USA, 1988, 45 min. 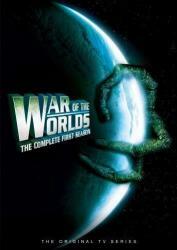 Synopsis At the end of the 1953 film "War of the World", earth is saved from alien invaders when they are apparently killed by common bacteria. However, what if the aliens weren't really dead? In "War of the Worlds" the aliens from the 1953 invasion are brought out of suspended animation when radiation kills the infecting bacteria. Now the aliens launch a genocidal war against an unsuspecting Earth, using their ability to take over human bodies to allow them to move freely. Dr. Harrison Blackwood teams up with microbiologist Suzanne McCullough, computer programmer Norton Drake, and army Lt. Colonel Paul Ironhorse to save the world from this alien menace. In the second season, Harrison and Suzanne are joined by mercenary John Kincaid, who help them fight in a post-apocalyptic urban wasteland against a second wave of invaders dedicated to the death of all life on earth.